In the past, especially before the rise of foam inserts and carry cases, many gamers would probably store and transport their miniatures in A4 box files. These days, whilst box files are still used, those of use who don’t want to be buried under a mountain of foam instead find ourselves with a number of Really Useful Boxes – sometimes a scary number! Sally 4th, having recognised the widespread use of these, have just released an MDF conversion kit for the 9 Litre Really Useful Box so that it will carry miniatures with 25mm round bases. Really Useful box conversion kits are released this week. These conversion kits take a Really Useful Box to the next level of usefulness! They allow two layers of figures to be stored safely and securely, each layer also being easy to lift out. This MDF kit is very easy to assemble and only needs some wood glue. The space inside a conversion kit allows for two inserts to sit snugly side by side on both the top and bottom layer. The idea behind this is that you can have two different inserts per layer. The height of each layer is 70mm. It is designed to fit inside a 9 litre Really Useful Box. 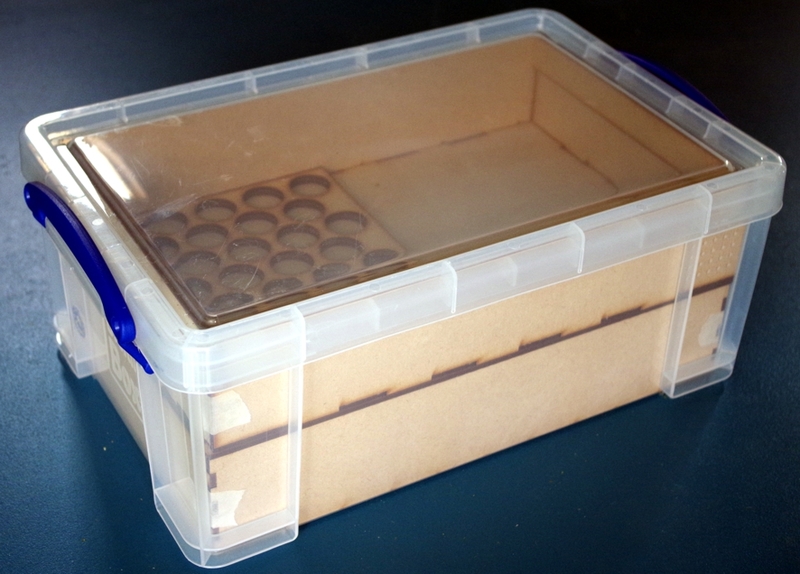 At the moment we have listed an insert for storing figures based on 25mm round bases. Each insert has slots for 36 miniatures, so a converted Really Useful Box with 4 inserts inside it would have slots for 144 miniatures. We have a lot more inserts designed and are happy to make any of the 40+ storage inserts that are currently available for our Warchest Figure Storage range to fit these boxes. These inserts include round, square, oval, hexagonal slots in every size imaginable together with special inserts to suit X-Wing, Star Trek Attack Wing, Wings of Glory, Sails of Glory and many other games and of course if we have not got an insert available that suits your needs, we are always willing to design one and add it to the range. I suspect several of these will be on my shopping list in the near future – after all, I have to find something in which to store all these Lord of the Rings miniatures that have mysteriously appeared recently. A nifty idea! Hope they make more designs. As much as I hate the place, Walmart purports to carry RUBs at a very good price on the western side of the pond..
How many 40mm bases could you fit into the 9 litre rub, over to lairs,”?